I thought twice about this product - but not necessary. Very sturdy thermal bottle holder - with sealed fit at the top. I have used several time already to keep my sauvignon blanc cool/cold. I use in my Texas backyard and it has kept the bottle cold for at least 2 hours ( after that there was none left ). I tried out my favorite champagne bottle and it fits perfect. 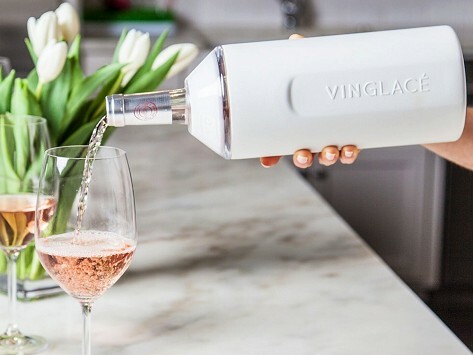 Alyson and Colton Haas created the Vinglacé stainless steel wine chiller when the Texas heat and their poolside gathering weren’t cooperating. The couple wanted to make it easier for bottles of wine, champagne, and even sparkling water to stay perfectly chilled—and eliminate the back-and-forth to the refrigerator or cooler. Their solution is like an elegant cooler made just for bottles. Place your chilled bottle inside Vinglacé and screw on the top. The doubled-walled, vacuum-insulated stainless steel design will keep things perfectly cool for hours, and it prevents drippy condensation, too. We really like how nice Vinglacé looks and are excited about it as a gift for weddings, showers, housewarmings, you name it. You won’t mind having it out on the table, in the backyard, or any place you want to sip and chill.